After the fantastic launch event I was invited to a few weeks ago, Bun & Bowl, Birmingham’s only Burger and Shrimp restaurant, invited me back for the full-size experience. Of course I was happy to oblige, so I headed over last Friday after work to sample the delights of their entire menu. We arrived at 7, where it was quiet but welcoming, and straight away we were seated by the huge windows with plenty of opportunities to people watch! 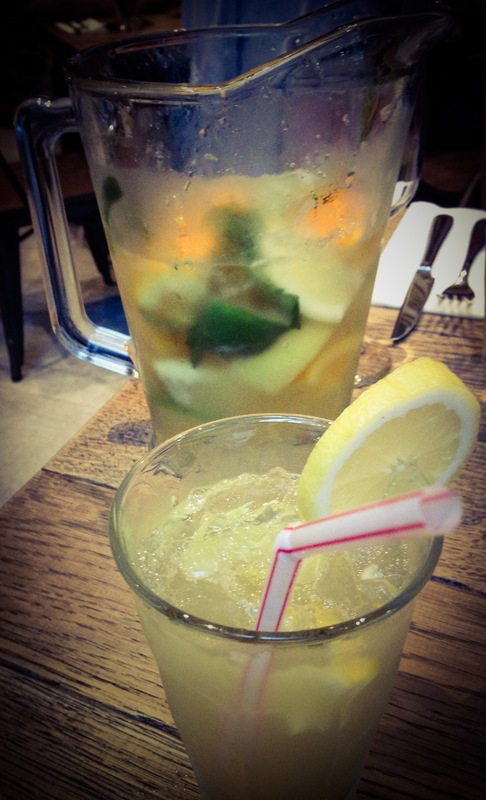 We had a pitcher of homemade lemonade to start with, which was really refreshing, perfect in the heat. The jug was reminiscent of Sangria with all the citrus and ice, which made it feel grown up and glamorous even without the alcohol. I was determined to try both the shrimps and a burger, so I went for the Shrimps in garlic, lemon and parsley sauce to start while my fellow diner went for the grilled halloumi. 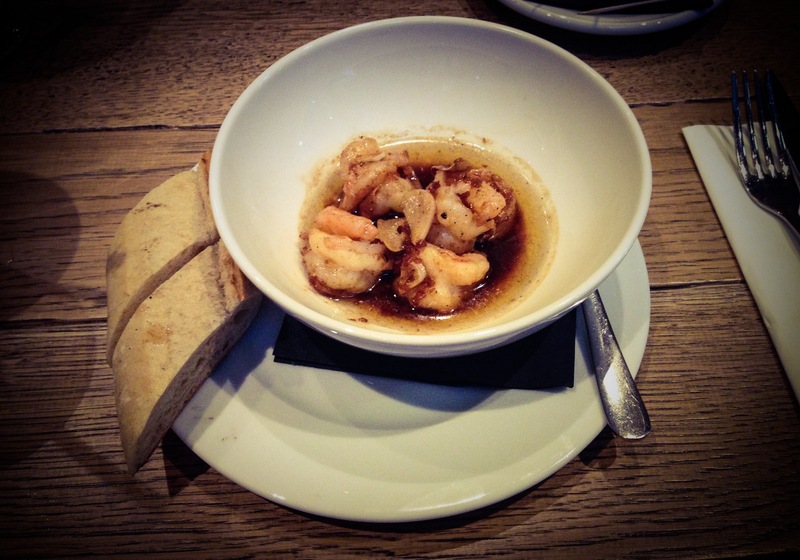 For me, the starter was divine, tender and meaty shrimp, LOTS of garlic and a subtle spice in the background, although I must admit I prefer shell-on shrimp as they just add even more to the flavour. A good portion size for a starter with fresh bread on the side to soak up all the olive oil too. 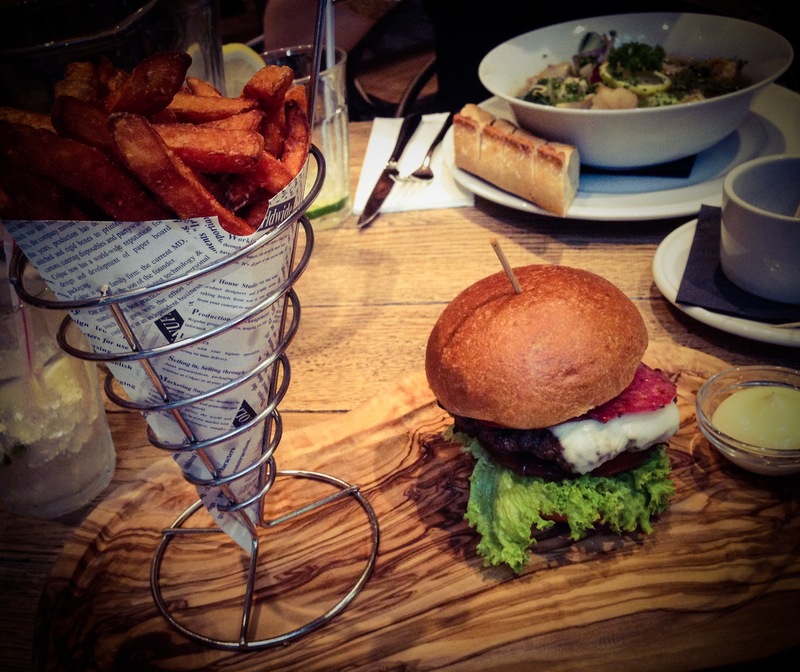 I then opted for the Italian Burger, a beef patty with Italian salami and mozzarella on top, which I had with sweet potato fries on the side. What I really like about the burgers here is that you can actually taste the beef because they’re not smothered in sweet barbecue sauces or ketchup. The flavour of the meat really stands out, the minimal but punchy ingredients and brioche buns it’s all served in make for a really fresh tasting take on the American classic that isn’t dripping in grease. I had my burger with extra caramelised onions which gave it another dimension, although I did make quite a mess as it was very juicy. The sweet potato fries were also fantastic, you can never go wrong with sweet potato fries in my book though! We didn’t fancy desserts, so it was onto the cocktail menu once we’d finished our meal. The manager and mixologist recommended a fantastic Lychee Martini made with gin, which was sweet, perfumed and very moreish served with a fresh lychee on the glass. Then he started to get creative, making us bespoke cocktails based on what we liked. 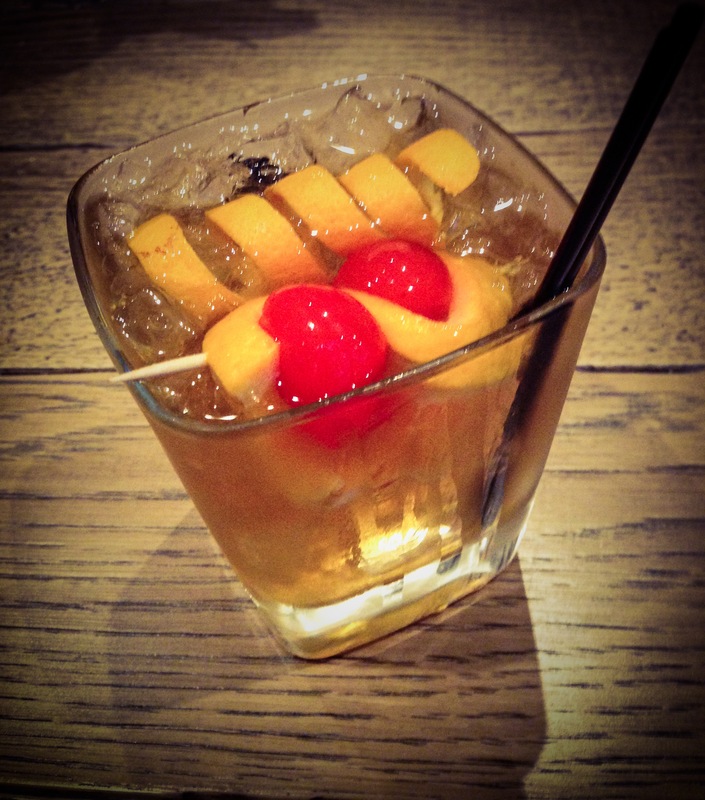 Mine had a bourbon base, with orange peel and glace cherries. It was a really smooth and warming drink, and once the cherries had absorbed all the bourbon I couldn’t help but eat them too! Then to round everything off, we had coffee cocktails, made with freshly ground beans, Amarula and orange. I didn’t think anything could beat the espresso martini but this one came in very close. It was creamy but not heavy and had a lovely coffee flavour that wasn’t too strong. I have to hand it to the staff too, our waiters were attentive and very friendly, and the charming manager made it a really enjoyable night. If you like your burgers fast food style then it isn’t for you, but if you want a refined take the classic burger, fries and shakes in a relaxed but cool environment, I recommend a trip to Bun & Bowl. My meal on Friday was complimentary, many thanks to Bun & Bowl, but all opinions are my own. You can find Bun & Bowl on level 7 of The Cube and book tables on 0121 643 9896.